CFOs do not have the luxury of time, so when they need to see concrete figures before making an important decision, they need to be able to pull up that information instantly. Thus, more and more leaders are relying on dashboards. And, with the data-driven nature of most businesses, these dashboards have begun to incorporate additional important metrics, not just big picture financial ones. Now, there are solutions that provide data about topics such as sales revenue, profitability, operations, and other tactical metrics. In addition, many of these dashboards don't just paint a broad picture but can also delve into the data at a more granular level. Ultimately, dashboards provide CFOs with real-time data, allowing for quicker analysis and faster decision-making. An up-to-date balance sheet is obviously an important resource to assess a company's financial picture. However, these don't always provide a good sense of any substantial changes that may occur in the near or distant future. As a result, CFOs should ensure that various projections are prepared for different scenario possibilities. Although it is important to create a firm budget, companies have to be realistic about unexpected shifts. By analyzing the impact of any potential changes ahead of time, companies will be better equipped to make decisions quickly and based on reliable calculations. The type of accounting software selected will really depend on the size and complexity of a company's financial portfolio. Fortunately, there are solutions available for businesses of all sizes. Some solutions allow for incredibly detailed oversight, whereas others provide for a more broad and general overview. Either way, given the range and affordability of the available options, there is no reason for companies to fail to keep up with accounting, even without the help of a bookkeeper or other professional. 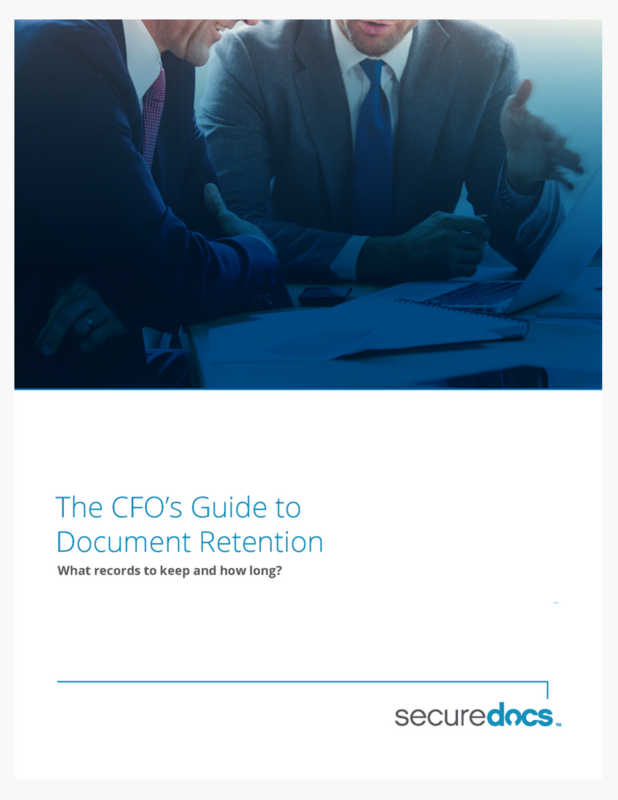 The CFO's Guide to Document Retention. Learn which documnets to keep and for how long. Click here to download now, and start reaping the benefits of a secure, organized office today. This is a broad and fairly generic category, but it is meant to encompass various analytical tools that offer comparative analyses. For example, CFOs will likely want to gauge progress by looking at trends that occurred over certain periods of time. Or, leaders may want to assess where they stand compared to competitors. The bottom line is that leaders cannot simply rely on data in a vacuum. They must also examine the significance of the data over time and against other types of data both internally and externally. Thus, it is important to invest in an appropriate data analytic tool that can quickly provide these sort of graphical snapshots. Depending on a company's needs and preferences, various business solutions may be needed to capture and analyze data. But, it may be difficult to grasp and organize disparate pieces of information that are scattered across platforms. Therefore, CFOs should ensure that their company has an online corporate repository to centralize all of this information. In general, companies should utilize a highly secure virtual data room to ensure that the documents they upload are coherently organized and adequately protected.